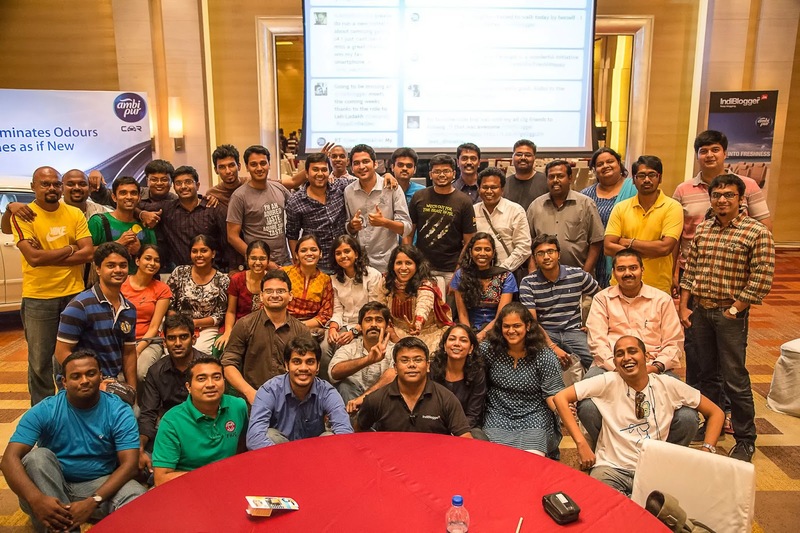 Day before yesterday Ambi Pur along with Indiblogger conducted a meet at Hyatt regency, Chennai. I registered earlier as the tags, Indiblogger and Hyatt was too attractive. My primary motive was just to enjoy and spend some time with friends, but the meet changed my whole perception of my expectation. Indiblogger has its own way of surprising the bloggers. I tagged along with a fellow Blog celebrity Prason Christopher Robin, who was kind enough to give me lift from my home itself. We wanted to be the early birds and we were the earliest birds. So we people went to lobby and waited for a while and enjoying all the honeycomb structures placed in the Hyatt, thanks to Prason for helping me figure out the structures. And by the time moved on we saw lots and Celebrity bloggers and celebrities too. Saying hello to all the blogger friends and friendly bloggers was a great experience. Then we went to the hall for the registration and after that we saw a car placed inside the nearby room, it intrigued to check out that stuff. We were blindfolded and asked to enter the car and whether able to check the freshness and it was awesomeeee (ya it deserves three “e”), after we explained the experience in a camera. As soon as we got out, the meet begun with usual 60 seconds to fame. All of us didn’t get the chance to express ourselves in front of the crowd still enjoyed the session. Then came the important session, the Lunch. It was the great time to mingle with new bloggers, and I got the chance to meet my idol and one of the most famous blogger Jackie Sekar. Took a personal snap with him and it was a great thing for me to take a snap with him. 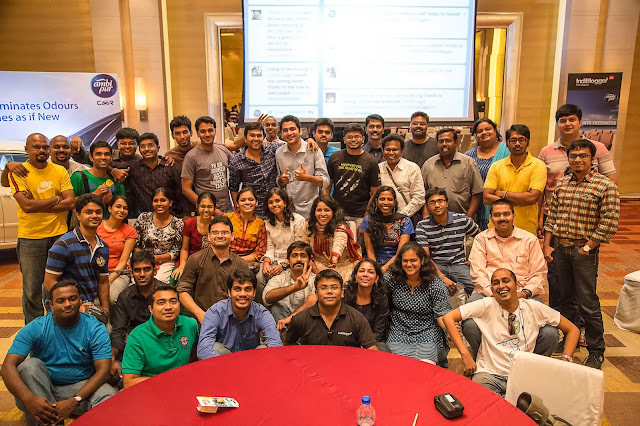 I have to thank Indiblogger for giving me the opportunity to meet such wonderful bloggers. And the food was also awesome and after food I got another chance to enter the car and experience the fresh air. I am lucky to enjoy the freshness twice. It was like heaven sitting in the front seat, blindfolded and enjoying the fresh air with a special fragrance. Which is practically impossible in roads today and Ambi Pur gave me the experience twice in a day. Post lunch session started off with the Ambi Pur marketing executive explaining about the product and what it does actually. On seeing those benzene rings it reminded me of my school days, where I loathed the Organic chemistry and today those organic compounds gave me a fresh experience. After the presentation is over the bloggers had the questions session and few asked very good question that were really intriguing and made the session lively. After that the funniest session of the day began, all of the bloggers were given Ambi Pur car freshener a sample and based on the fragrance teams were divided. Each team was asked to perform a skit based on the given theme. Luckily our team was lead by Anand Arun ( The winning captain Chennai Super Bloggers of the Indian Bloggers League of last year). Our theme was to perform a Vadivelu, Senthil, Vivek comedy skit. We mixed the scenes of Banana joke, Enna thaan venum (Oil is what I need), Chandramukhi and Attagasam. It was typical Tamil movie style but we themed it at the Ambi Pur Freshness. Of the biggest role or the role with most dialogues, the role appearing in more scene is portrayed by me, that makes me a protagonist pretty much. And we lost the best skit to the Chronicwriter’s (Prason Christopher Robin) team. Well those guys deserved the victory and it was an honour to compete with Chronic writer’s team. Other teams were also gave us a tough fight. At the end of the day everybody was happy, Chronic writer won a Samsung S4 for his tweet, which is well deserved. Thus the day ended and we all begun to move and Indiblogger gave us snack and Tea not only the T- shirt. The meet turned into an experience, I have to thank ambi pur for giving us a pure ambience and making the day a freshest day to remember. Tweets were running on the screen the whole day, and all are enjoyable. To say in a style the awesomatic, beautiful and bestest day in my life. Jackie-oda edutha photo post pannala? Good to knw abt ur experience. This is d first time I've heard of Indiblogger. Ignorant me. Registered to it right away. Following Jackie's posts too. Thanks Gopal.